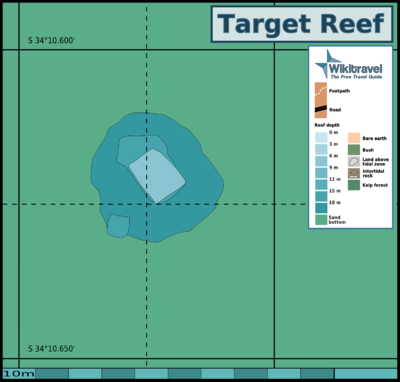 The dive site Target Reef is an offshore rocky reef with concrete structure in the Simon's Bay area of False Bay, near Cape Town in the Western Cape province of South Africa. Visibility will vary depending on the season and recent weather conditions. In summer it will usually be better than 5m in conditions suitable for diving, and in winter it will usually be better, and could exceed 20m on a good day, though more likely to be between 10 and 15m. This is a small nearly circular reef about 40m across, of rubble, boulders and some granite bedrock rising from sand at about 22m up to the base of a concrete structure at about 18m. The structure on top is large reinforced concrete block about 12m high and 10 to 12m along each side. It is reported to be identical to the blocks used for the new harbour wall at Simon's Town naval dockyard. The top is severely damaged, presumably by gunfire, as it was a base for targets. Steel reinforcing bar projects from broken concrete all over the top, and large chunks of debris are held in place by some of these bars. Two large chunks of concrete structure have fallen down to the reef. One is right at the base of the main structure, to the north west, and the other has rolled or slid down to the sand edge to the south west. The shallower one has deep holes accessible from the top towards the main block, and the deeper one is open at south west end, with a small opening at the north east end, which looks too small for access. These are shown on the map. Geology: Pre-cambrial granite of the Peninsula pluton. The rubble around the base is likely to include concrete fragments of the structure, and possibly other rubble brought to the site when the structure was built. The reef is surrounded by flat fairly fine silica sand. The site is exposed to wind and waves from the south east, so should be dived when there is no south easterly wind. Conditions are more likely to be good in winter, or at any other time when the wind is westerly. The site is reasonably protected from south westerly swells, but if long period south westerly swells are produced by storms in the South Atlantic then the swell refracting around Cape Point into False Bay may be sufficient to make the site undivable. The site will usually be at it's best in winter, but there are also occasional opportunities at other times of the year. Lots of red bait on top of the broken piece at about 18m, which is deep for red bait. Otherwise, very heavy redbait encrustation arund top of structure, but walls relatively bare Rubble covered with similar benthic invertebrates to Castor reef. Shoal of smallish hottentot over top of structure. Large concrete structure with a couple of holes big enough for divers to enter. This is not a particularly good site for photography. The biological diversity is not very high, and the site is small. Macro equipment is most likely to produce good results. The site is small and can be comprehensively visited on a single dive. The main block of the target base is the start and end point for most dives, and it is worth visiting the large fragment of the structure to the south west at the sand edge, and the other large fragment at the north west corner of the base. There are a large number of projecting steel reinforcing bars all over the top of the structure, and in places on the big fragments. these may be sharp enough to cause injury or equipment damage if bumped into with sufficient force. This may happen if there is a large swell running, or as a result of inattention or clumsiness by the diver. Remain aware of your surroundings when near these bars. No special skills are required. The central part of the site is shallow enough for entry level divers. Reasonable buoyancy control is recommended, particularly when over the reinforcing bars. This page was last edited on 25 May 2011, at 10:38.